If there’s anything worse than having a big pimple, it could probably be discovering pesky scars caused by acne breakouts. Pimples and acne scars are perhaps among the dilemmas that women have to deal with every day. Those stubborn blemishes leave a bad impression on your face and can make you self-conscious. If you’re struggling with acne and blemishes, do not lose hope because there are a lot of ways to conceal those troublesome scars and skin issues. While it’s best to allow pimples to heal naturally, you positively have the option to conceal them for the meantime. There’s no need to wait for your acne to go away; a lot of remedies are available if you want to have a flawless skin right away. 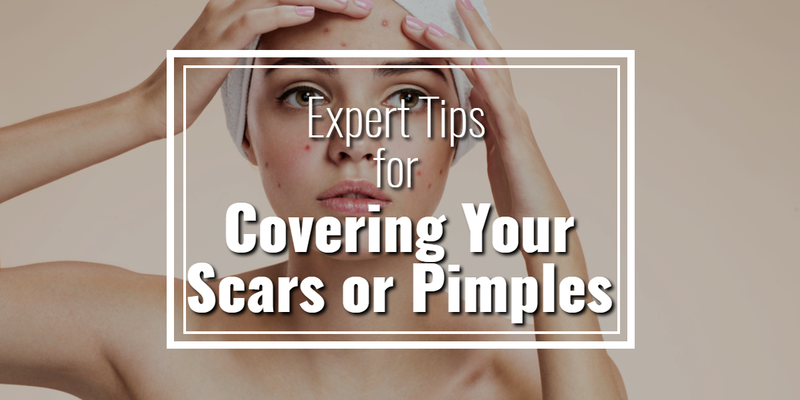 Let us give you expert tips for covering your pimples and acne scars. We list down some of the fastest and easiest ways to help you restore soft skin and boost your confidence. Definitely, the best way to have a flawless look is to solve the root cause of the problem. If you’re looking to treat your pimple the natural way, you can follow this step. Wrap an ice cube in a paper towel or any clean cloth and then apply it on your pimple for a minute. It will help you to cool down the temperature and bring down the swelling of your pimple, but make sure to wrap up the cube so that it won’t irritate your skin. With this procedure, you’ll be able to reduce the lump and effectively conceal a pimple making your skin looking smooth and flawless again. When you develop a pimple on dry skin, the blemishes are likely to be flaky, so apply a small amount of oil-free moisturizer to prevent your scars from looking dry. Aside from treating blemishes, applying a moisturizer on your face also allows you to apply makeup properly. Without a moisturizer, your makeup will look patchy and badly-applied. A primer is a base for foundation and allows the layer of cosmetic products to last longer on your face. Aside from that, the primer also helps smooth any wrinkles and large pores and makes your skin oil-free throughout the day. With the help of this product, you can be sure that your pimples are protected from outer dirt. It shields your skin from harsh chemicals and daily pollution damage. Using your fingertips, apply a primer all over your face and wait for a few minutes before proceeding to the next step. Perhaps, one of the best inventions made for women is the color corrector. This product magically makes your face looking brighter and flawless by neutralizing the color of your entire face, from the dark circles around your eyes to the nasty acne scars in your cheeks. But be careful in choosing a color corrector because a wrong shade might do more harm than good. It is important to use a color corrector based on your specific needs. For example, if your scars are reddish, you should use a green color corrector concealer to hide them. Use a yellow color corrector if your scars are purple and orange color corrector if your scars are blue. The reason behind the use of contrasting colors is to camouflage imperfections and discolorations on your face. Take a small amount of color correcting concealer and dab onto your scar. Blend it in until the scar is completely concealed. Do not use too much because it can leave your skin with unwanted hues. A concealer helps in covering dark spots, dark circles, and even freckles on your face. This is an important item for creating a perfect complexion, but like the other cosmetic products, a wrong shade and application of this product may also make you look tired and old. Choose a concealer that’s close to your skin tone for a natural-looking finish. Dab the concealer onto your scar with a brush, a makeup sponge, or even your finger and gently blend it in. Repeat this process until you achieve your desired coverage. Soften the edges of the concealed spot by blending outward. If you want to erase redness caused by pimples, put on a yellow-hued concealer. With so many types of face powders in the makeup shelves these days, it’s hard to decide which one is appropriate to use on a certain condition. But don’t let the number of face powders confuse you, each of them has its own purpose, so all you have to do is keep in mind that for instances when you have to hide a skin problem, either the pressed or loose powder is your way to go. If you have dry skin, your best option is the loose powder because it gives a seamless, natural appearance without looking shiny or oily. The pressed powder, on the other hand, is ideal for people with normal or oily skin because it provides a matte finish look. Dip a powder brush into loose or pressed powder and tap off any excess. Apply it over the area you have concealed. Make sure your brush should not be too hard to avoid smudging your blush and eye-shadow. The powder will help you to set the concealer and keep it in place until you wash it off. Exposing a scar to the sun without any sunscreen or protective clothing is the worst thing because the sun can damage your skin more. It can result in delayed or improper healing of your scars or pimples. You can also make your pimples worse by using cleansers or applying products that contain irritating ingredients, so it is important to use safe products at all times to keep your skin protected from further damage.